Jewish Worship Pennant, flying over the national ensign (U.S. flag) on a U.S. Navy ship. The insignia for Christian, Muslim, and Jewish chaplains are shown on the uniforms of three U.S. Navy chaplains. The Chaplain Corps of the United States Navy consists of clergy who are commissioned naval officers. Their principal purpose is to "promote the spiritual, religious, moral, and personal well-being of the members of the Department of the Navy," which includes the Navy and the United States Marine Corps. Additionally, the Chaplain Corps provides chaplains to its sister sea service, the United States Coast Guard. The Chaplain Corps consists of clergy endorsed from ecclesiastical bodies, providing assistance for all Navy, Marine Corps, Merchant Marine, and Coast Guard personnel and their families. Navy chaplains come from a variety of religious backgrounds; chaplains are Catholic, Protestant, Orthodox, Jewish, Muslim, and Buddhist. Chaplains have non-combatant status and do not have the right to participate directly in hostilities. In the U.S. they are prohibited from carrying weapons. Chaplains are assisted by Navy enlisted personnel in the Religious Program Specialist (RP) rating, when available. Otherwise, a variety of personnel in the Marine Corps, Navy, and Coast Guard—as applicable—may support unit chaplains. RPs who are combatants, also serve as the armed protection for chaplains in combat and other operational environments. Since RPs are enlisted, the Chaplain Corps, while protective of them, does not "own" the rating. The history of the Chaplain Corps traces its beginnings to 28 November 1775 when the second article of Navy Regulations was adopted. It stated that "the Commanders of the ships of the thirteen United Colonies are to take care that divine services be performed twice a day on board and a sermon preached on Sundays, unless bad weather or other extraordinary accidents prevent." Although chaplains were not specifically mentioned in this article, one can infer that Congress intended that an ordained clergyman be part of ship's company. United States Navy Chaplain Corps was established on 28 November 1775. The Continental Navy, predecessor of the United States Navy, was approved by the Second Continental Congress on 13 October 1775. It was administered by a Marine Committee of three members later expanded to seven members. The Navy Regulations adopted by the Marine Committee on 28 November 1775 mirrored those of the Royal Navy. The second article of the Navy regulations of 1775 read: "The Commanders of the ships of the thirteen United Colonies, are to take care that divine service be performed twice a day on board, and a sermon preached on Sundays, unless bad weather or other extraordinary accidents prevent." Although the chaplain is not mentioned in this article, the reference to a sermon implies that Congress intended that an ordained clergyman be on board. The first mention of a chaplain in the Journals of the Continental Congress refers to his share in the distribution of prize money. On 6 January 1776 Congress passed a resolution detailing the prize share percentages and includes distribution of a portion to the chaplain. On 15 November 1776, Congress fixed the base pay of the chaplain at $20 a month. The first chaplain known to have served in the Continental Navy was the Reverend Benjamin Balch, a Congregational minister, whose father had served in a similar capacity in the Royal Navy. Benjamin Balch's son, William Balch, is the first chaplain known to have received a commission in the US Navy after the department was established in 1798. During World War II, at least 24 Chaplains died, with three being killed during the Attack on Pearl Harbor. The Navy accepts clergy from religious denominations and faith groups. Clergy must be endorsed by an approved endorsing agency. Once endorsed, clergy must meet requirements established by the Department of the Navy including age and physical fitness requirements. A chaplain's ecclesiastical endorsement can be withdrawn by the endorser at any time, after which the chaplain is no longer able to serve as a chaplain. Qualified applicants must be US citizens at least 21 years old; meet certain medical and physical fitness standards; hold a bachelor's degree, with no less than 120 semester hours from a qualified educational institution; and hold a post-baccalaureate graduate degree, which includes 72 semester hours of graduate-level coursework in theological or related studies. At least one-half of these hours must include topics in general religion, theology, religious philosophy, ethics, and/or the foundational writings from one's religious tradition. Accredited distance education graduate programs are acceptable. However, according to Program Authorization 110 2/3rds of the degree must be done in residence at the graduate level. Chaplains then attend the Navy Chaplain School at Ft. Jackson, South Carolina, at the Armed Forces Chaplaincy Center (AFCC). The Navy has a "Chaplain Candidate Program Officer" (CCPO) Program for seminary students interested in obtaining a commission before completing their graduate studies. 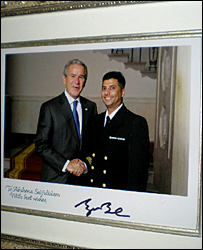 President George W. Bush congratulates Imam Abuhena Saifulislam, the first US Navy Muslim chaplain assigned to the Marine Corps. The Naval Chaplaincy School and Center (NCSC) is part of the Armed Forces Chaplaincy Center (AFCC), which also includes the US Army Chaplain Center and School (USACHCS) and the US Air Force Chaplain Service Institute (AFCSI). The 3 schools are co-located at Fort Jackson, in Columbia, SC. NCSC's first graduating class – consisting of 29 chaplains and chaplain candidates – graduated on 6 November 2009. NCSC is the successor of the Naval Chaplains School, which relocated in mid-August 2009 from Newport, RI, due to the 2005 decision of the Base Realignment and Closure Commission to put all military ministry training at the same location. NCSC's new name reflects its new mission of training Navy chaplains and Religious Program Specialist (RPs) in the same place. Until recently, RPs had been trained at NTTC Meridian, MS. The AFCC is designed to foster closer cooperation between the 3 Chaplain Corps and to facilitate shared instruction and training. Promote ethical and moral behavior throughout the Sea Services. Ensure religious ministry enhances current readiness. Think strategically for future readiness. Employ Reserve religious ministry assets more effectively. Realign assets to improve religious ministry for operational forces. Enhance external and internal communications. Leverage technology to support the mission. Mission-ready Sailors, Marines and their families, demonstrating spiritual, moral and ethical maturity, supported by the innovative delivery of religious ministry and compassionate pastoral care. The United States Navy is required to be responsive to diverse requirements of sailors, Marines, Coast Guardsmen, Merchant Marines and all their family members. Since its inception over two centuries ago, the United States Navy Chaplain Corps has experienced several controversies to fulfill such requirements as a Staff Corps community within the U.S. Navy. Some contemporary controversies include the filing of class-action lawsuits by "non-liturgical" active and former active-duty Protestant chaplains alleging religious discrimination. These chaplains argued that the Navy allegedly employed a quota system that caused "non-liturgical" Protestant chaplains to be underrepresented through the current career promotion established by the Department of the Navy. In the Pew Forum on Religion & Public Life, Accommodating Faith in the Military (dated 3 July 2008) states: "That precise question has been raised in a series of cases, going back a decade, over the way that the Navy selects chaplains. These lawsuits allege that the Navy has hired chaplains using a "thirds policy," a formula dividing its chaplains into thirds: one-third consisting of liturgical Protestant denominations (such as Methodists, Lutherans, Episcopalians and Presbyterians); another third consisting of Catholics; and a last third consisting of non-liturgical Protestant denominations (such as Baptists, evangelicals, Bible churches, Pentecostals and charismatics) and other faiths. The lawsuits claim that the Navy's criteria are unconstitutional because they disfavor non-liturgical Protestants, who make up a great deal more than one-third of the Navy, while Catholics and liturgical Protestants each makeup less than one-third. In April 2007, a U.S. District Court in Washington, D.C., rejected one of these challenges to the Navy's chaplain-selection criteria. The court held that the Navy had abandoned the thirds policy and said that its current criteria were constitutional because the Navy has broad discretion to determine how to accommodate the religious needs of its service members. This decision was affirmed in 2008 by the United States Court of Appeals for the District of Columbia Circuit. In June 2009, the Navy's Inspector General found that the Deputy Chief of Chaplains, RDML Alan Baker, took actions which "reprised against" his former Executive Assistant during a promotion board in 2008 and was subsequently not recommended for his second star and selection to Chief of Chaplains by the CNO. This determination found that Adm Baker improperly influenced a Captain (06) promotion board in a negative manner. Chaplain Baker retired in September 2009. The current (27th) Chief of Chaplains for the Navy is RADM Brent W. Scott. Chaplain Joseph T. O'Callahan ministers to an injured man aboard USS Franklin, 1945. A US Navy chaplain celebrates Catholic Mass for Marines at Saipan, June 1944, commemorating comrades fallen in initial amphibious landings. Enough knowledge to cope and some plain common sense. Be at our side on those nightly patrols; And be merciful judging our vulnerable souls. Make my hands steady and as sure as a rock; when the others go down with a wound or in shock. Let me be close, when they bleed in the mud; With a tourniquet handy to save precious blood. Here in the jungle, the enemy near; Even the corpsman can't offer much lightness and cheer. Just help me, oh Lord, to save lives when I can; Because even out there is merit in man. If it's Your will, make casualties light; And don't let any die in the murderous night. These are my friends I'm trying to save; They are frightened at times, but You know they are brave. Let me not fail when they need so much; But to help me serve with a compassionate touch. Lord, I'm no hero—my job is to heal; And I want You to know Just how helpless I feel. Bring us back safely to camp with dawn; For too many of us are already gone. Lord bless my friends If that's part of your plan; And go with us tonight, when we go out again. Barry C. Black – Chaplain for 27 years and 22nd Chief of Chaplains of the Navy. Robert R. Brett – Chaplain during Vietnam War. Vincent R. Capodanno – Chaplain during Vietnam War. Third chaplain and second Navy chaplain to be awarded the Medal of Honor. USS Capodanno was named in his honor. John P. Chidwick – Chaplain on USS Maine. Thomas M. Conway – Chaplain during World War II (USS Indianapolis). Frederic P. Gehring – Chaplain during World War II. First Navy chaplain awarded the Legion of Merit for conspicuous gallantry. John F. Laboon, Jr. – Chaplain during Vietnam War. Awarded the Legion of Merit. USS Laboon was named in his honor. John L. Lenhart – Chaplain during Civil War. First Navy chaplain to lose his life in battle. Adam Marshall – First Catholic chaplain in the Navy. Joseph T. O'Callahan – Chaplain during World War II. Awarded the Medal of Honor. USS O'Callahan was named in his honor. John Joseph O'Connor – Chaplain during the Korean War and 14th Chief of Chaplains of the Navy. Later Roman Catholic Archbishop of New York and Cardinal. George S. Rentz – Chaplain during World War I and World War II. Only Navy chaplain to be awarded the Navy Cross during World War II. USS Rentz was named in his honor. Aloysius H. Schmitt – First chaplain to die in World War II; chaplain on USS Oklahoma during the attack on Pearl Harbor. USS Schmitt was named in his honor. ^ Per U.S. Navy customs, traditions and etiquette, Worship Pennants may be flown above the Ensign "Naval Customs, Traditions, & Etiquette – Church Pennant". U.S. Fleet Forces. United States Navy. Archived from the original on 13 June 2015. ^ "NHHC". www.history.navy.mil. Retrieved 3 April 2018. ^ See also: "History of the Chaplain Corps" (1993). US Coast Guard website (Chaplain of the Coast Guard). Written by Commander Margaret G. Kibben, CHC, USNR, History Projects Officer, Chaplain Resource Board. Retrieved 3 December 2009. ^ Drury, Clifford Merrill (May 1994). History of the Chaplain Corps, Part 2: NAVEDTRA 14282 (PDF). Naval Publications and Forms Center. p. 206. NSN: 0500-LP-288-0000 – via NavyBMR.com. ^ Vanderwerff, Steve (November 10, 2009). "First Group of Navy Chaplains Graduate from NSCS Fort Jackson". navy.mil. United States Navy. Retrieved 2017-06-18. ^ Rod Powers, "Navy Commissioned Officer Job Designators Description & Qualification Factors (chaplain). About.com Guide. Retrieved 5 December 2009. ^ Chaplain: Officer: Careers & Jobs: Navy. US Navy official website. Retrieved 3 December 2009. ^ a b c d "First Group of Navy Chaplains Graduate from NSCS Fort Jackson". Navy.mil (USN official website), 11 October 2009. By Steve Vanderwerff, Naval Education and Training Command Public Affairs. Retrieved 3 December 2009. ^ "Navy Chaplain School Relocates". Navy.mil (USN official website), 21 October 2009. By Pat Fisher, Navy Chief of Chaplains Public Affairs. Retrieved 5 December 2009. ^ "Harry Potter to work his magic at AAFES". stripes.com. Retrieved 3 April 2018. ^ Soccaras, Lisa, "Fr. Mode Battles for Souls", CathMil.org (Catholics in the Military), 23 October 2009. Navy chaplain assigned as a USCGA chaplain in June 2009. Retrieved 2 December 2009. ^ "Locations" of Navy chaplains assigned to USCG (5 June 2009). U.S. Coast Guard official website (Chaplain of the Coast Guard). Retrieved 3 December 2009. ^ To access the prayers, go to Coast Guard prayers Archived 27 September 2011 at the Wayback Machine and then (in the left-hand column) click on "USCG". ChaplainCare (online Navy chaplain corps "Distance Support") official website. Retrieved 3 December 2009. ^ To access the prayer, go to Marine Prayer Archived 27 September 2011 at the Wayback Machine and then (in the left-hand column) click on "USMC". ChaplainCare (online Navy chaplain corps "Distance Support") official website. Retrieved 3 December 2009. ^ At the following webpage, scroll down to "Lieutenant Robert R. Brett • Vietnam War • 1936–1968". Centner, Pat. "No Greater Love: A Memorial Day Salute to Military Chaplains". American Family Association. Archived from the original on 25 April 2012. Retrieved 6 November 2011. [He] joined the 2nd Battalion, 26th Marines near the Khe Sanh Combat Base in Vietnam. .... On 22 February 1968, [he] and his aide [PFC Alexander S. Chin] found themselves on an air strip in Khe Sanh ... when they came under enemy fire. ... Brett told the chopper to take off without him and his aide, which allowed Lt. Pete Post to go instead. ... [A]n incoming rocket struck, killing Brett, Chin and eight others. .... [In 1998 and 1999, their remains were moved to Arlington National Cemetery and] buried on Chaplain's Hill ... – united in death as they had been in life. ^ "Robert Raymond Brett / Alexander Scheleph Chin". Arlington National Cemetery Website. Michael Robert Patterson. 20 August 2006. Retrieved 28 November 2011. ^ "Robert Raymond Brett". 13 November 2010. Archived from the original on 1 December 2011. Retrieved 28 November 2011. He was ordained in the Marist order in 1962 and enlisted in the Navy in 1967 .... LT Brett's name appears on the Philadelphia Viet Nam Memorial. ^ See: Vincent R. Capodanno § Capodanno Hall, San Francisco Bay Naval Shipyard. ^ Milhomme, Bill (9 July 2010). Fr. Thomas Conway: 65th Anniversary Sinking USS Indianapolis. "Lt. (Rev.) Thomas M. Conway, a 37-year-old Navy Chaplain ... was sleeping soundly on July 31, 1945, on board the USS Indianapolis ...." Retrieved 18 August 2011. ^ Announcement of the Father Thomas Conway Memorial (June 2006). USS Indianapolis Museum Archived 30 December 2006 at the Wayback Machine official website (in the left-hand column, click on "2006 Museum Activities"). Retrieved 18 August 2011. ^ FatherThomas Conway Memorial. ussindianapolis.org message board -> Photos -> FatherThomas Conway Memorial. 23 October 2007. Retrieved 18 August 2011. ^ "Chaplain John L. Lenhart, USN, (1805–1862)". Naval Historical Center. 29 June 2001. Retrieved 7 November 2011. A Methodist Minister, ... Chaplain John L. Lenhart was killed in action during [USS Cumberland's] ... fight with the Confederate ironclad Virginia on 8 March 1862, the first Navy Chaplain to lose his life in battle. ^ "Rev. John L. Lenhart (1805–1862) / Memorial Plaque Dedication" (PDF). Tottenville Historical Society (Tottenville, Staten Island, N.Y.). 15 November 2008. Archived from the original (PDF) on 21 April 2012. Retrieved 7 November 2011. ^ At the following webpage, scroll down to "Chaplain John L. Lenhart • Civil War • 1805–1862". Centner, Pat. "No Greater Love: A Memorial Day Salute to Military Chaplains". American Family Association. Archived from the original on 25 April 2012. Retrieved 6 November 2011. ^ See also: USS Cumberland (1842)#American Civil War. ^ "First Catholic Chaplains in U.S. Army and Navy". Woodstock Letters. LXX (3): 466–467. 1 October 1941. Archived from the original on September 16, 2018. Retrieved September 15, 2018 – via Jesuit Online Library. ^ "Cardinal O'Connor – His Life". Bergsma, Commander Herbert L. (1985). Marine Corps Historical Division, ed. Chaplains with Marines in Vietnam 1962–1971. United States Marine Corps. PCN 19000309100. Retrieved 12 December 2008. O'Brien, Steve. Blackrobe in Blue: The Naval Chaplaincy of John P. Foley, S.J. 1942–1946. Armed Forces Chaplains Board[permanent dead link] (AFCB). Instruction Number 5120.08 (20 August 2007). Department of Defense. Retrieved 2010-09-09.